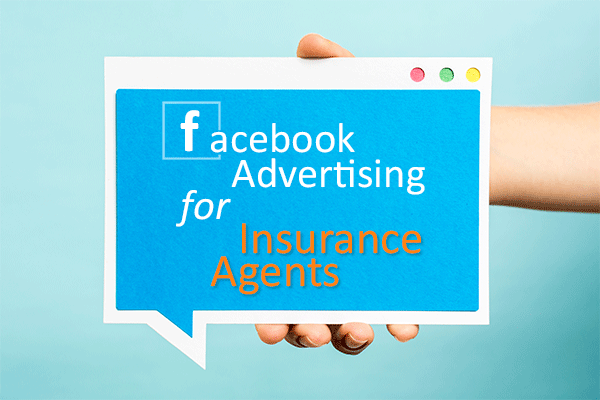 For starters, if you haven’t read it yet, we recommend you take a look at “Social Marketing for Insurance Agents” for a general overview of social media marketing before diving deeper into Facebook Advertising. Remember, this is just one channel in your marketing strategy. Your marketing efforts will be much more successful when used in combination with other channels. Giving your prospects multiple points of communication will increase your ability to connect to your prospects and to create a long term relationship with them. 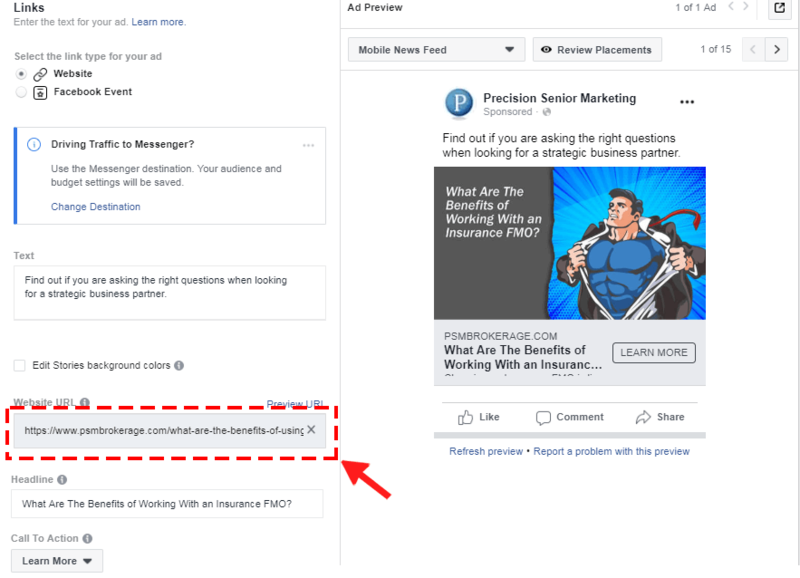 In this article we are going to continue, in detail, to describe how to create a Facebook Insurance Ad. 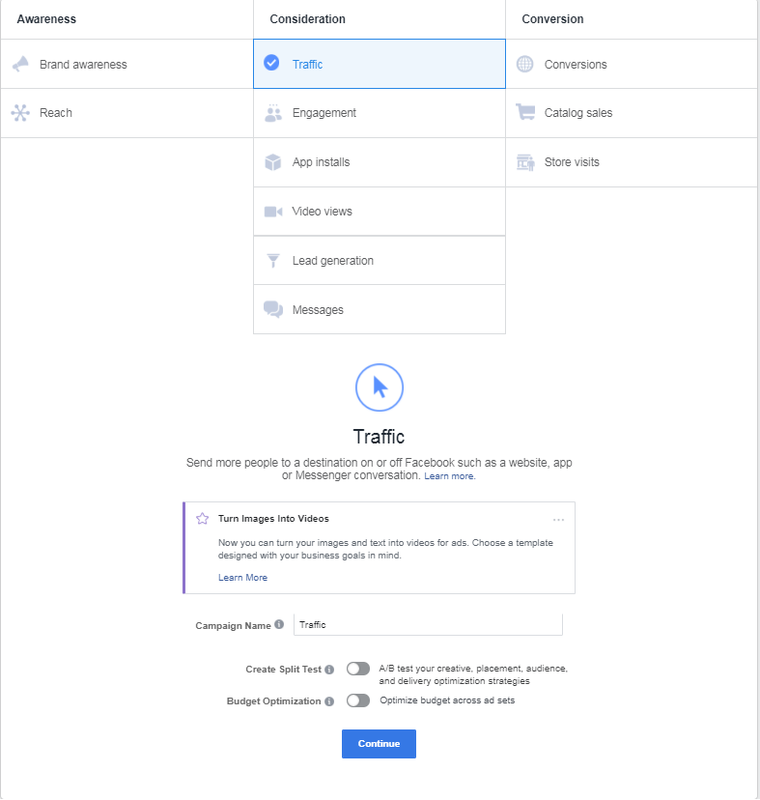 There are a lot of options within the Facebook Ads Manager. We will run through the basics of creating an Ad and point out some key points to keep in mind when creating an Ad. 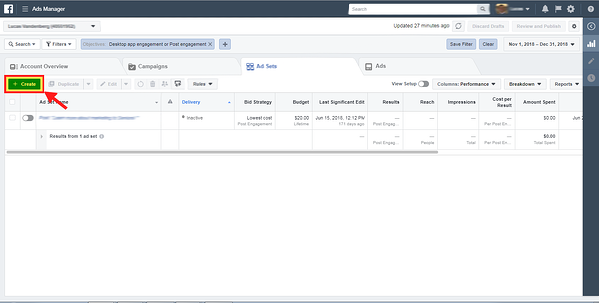 Let's get started by navigating to the Ads Manager within your Facebook business page. This is where you will create new ad campaigns or get an overview of your current ads. If you haven't created your Facebook Business Page yet, what are you waiting for? From your Facebook business page, click on Pages in the top left menu and select Ads Manager. Clicking Ads Manager will take you to the page below. To create an Ad Campaign, click Create. On the next page, ensure you are in the "Create New Campaign" tab at the top, (Underlined in blue) and review the options under marketing objective. 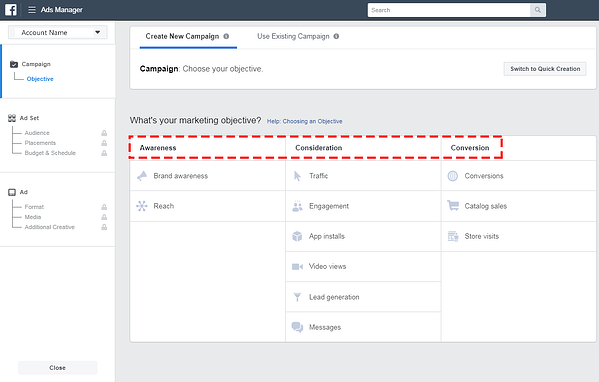 Before we select a Marketing Objective, let's review the Ads Manager screen and get familiar with the different sections. In the upper left corner you see your ad account id#. 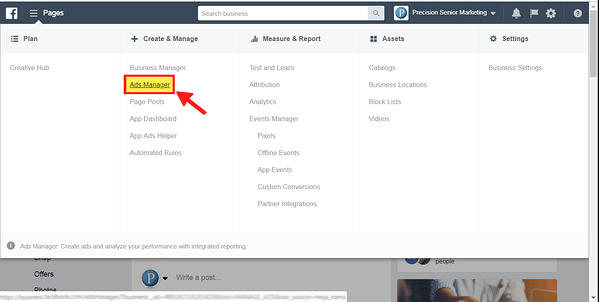 If you have access to business manager or access to other ad accounts you would see them listed here in the drop-down menu. The column on the left is the work flow for creating your ads. Each step must be completed before you ad is ready to be published. At the very top, and the beginning of the ad creation process is the Campaign level. This is where you choose your Objective. What do you want this ad to accomplish? At the lowest level of the ad process you have your creative. This is what the target audience sees when you ad is displayed. Images, text, links, and call to action. So, lets start by selecting a marketing objective. 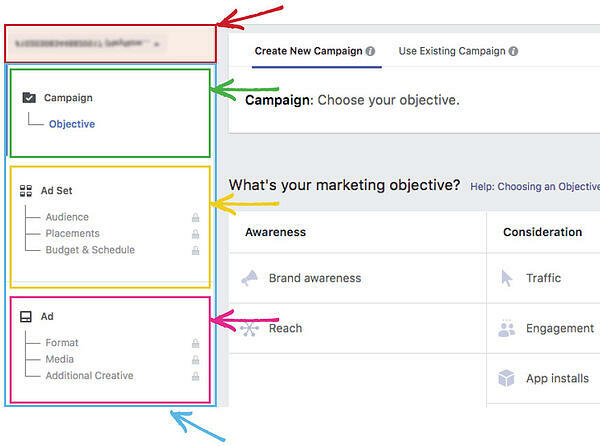 When you choose a marketing objective Facebook will optimize your campaign for that selected goal. Facebook will then deliver your ad to people that have proven to be more likely to carry out the desired result your looking for. if you choose traffic, which will allow your ad to link to a landing page on your website, Facebook will show your ads to people who have proven to be more likely to click on those types of links. Let’s review the Marketing Objectives and their definitions. Awareness: Generate interest in your content or your product. The brand Awareness objective is for reaching people with the intent of creating awareness of who you are and what you have to offer, without the expectation of a click or action of any kind. Consideration: With Consideration you are trying to get interest in your business and encourage them to do business with you. This is the stage where you need to build a relationship with your prospects. Conversion: Get the audience to purchase your product or service. Now that we know what it means, let's choose the Traffic objective. 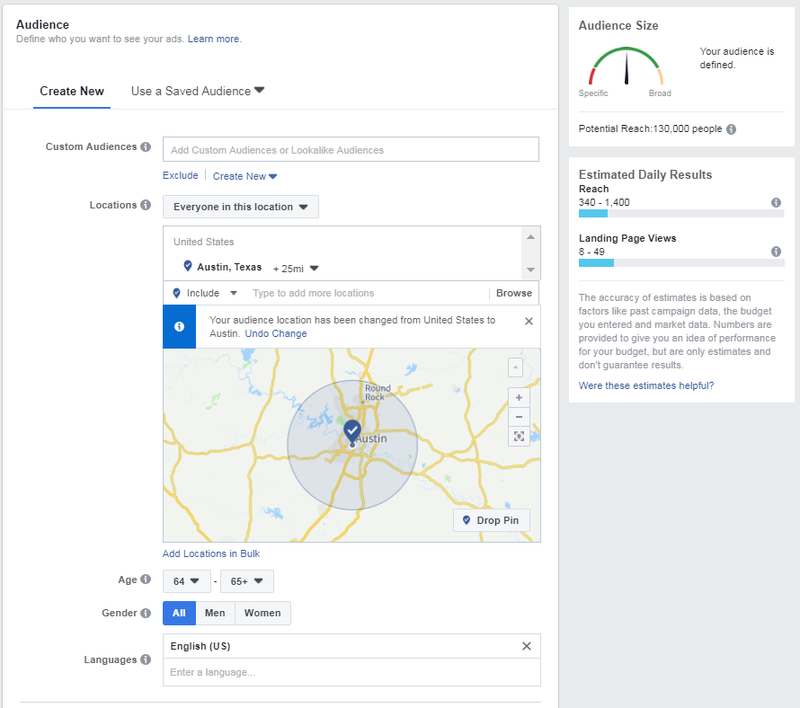 This will tell Facebook to show your ad to people who fit your audience description and have a history of clicking links to websites outside of Facebook. We are looking to get our prospects to click the link which in turn will bring them to a website landing page. This is where you will have an offer they can't resist, and will be prompted to enter their contact information, becoming a newly minted lead. After setting your Objective it’s time to set your Audience. Facebook has over 2 billion users, so you’ll probably want to narrow that down a bit. By thinking in terms of your audience or persona you are trying to engage with, you can break down the larger group of “seniors”, if you wish, into many smaller groups for hyper-targeting. The size of your audience is up to you. Are you targeting local seniors within a 25mi. radius of your location or are you targeting seniors on a national scale? Whichever you choose, ensure your content offer is appropriate for the audience you are selecting. If you are marketing to seniors across the country, make sure your offer is actually applicable to people across the country. If it isn't, you may want to consider creating separate ads for different locations. If you have a list of contacts Facebook allows you to upload them using the Custom audience option and find them in Facebook. There is also the option to find a Lookalike audience. The Lookalike audience is a tool that allows you to target users whose demographics and interests are similar to that of your existing business page followers. This type of targeting is where Facebook excels. 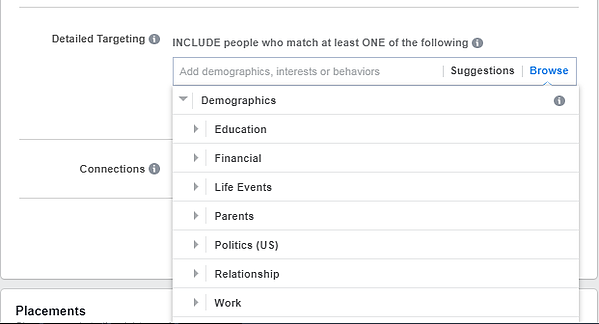 Facebook uses Its massive database to connect the dots and find a relevant audience that you may not have been able to reach otherwise. Facebook advertising allows you to post on other Facebook properties like Instagram and Messenger. For this example, we are going stick with Facebook. You have the ability to select the budget and reach for your ad campaign. 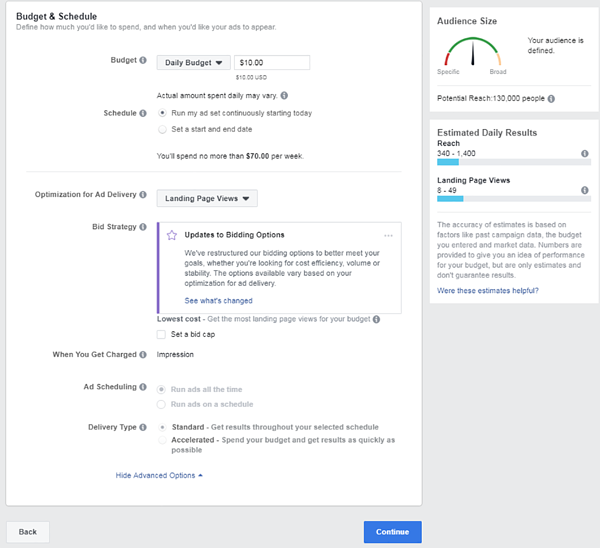 Select a length of time you would like to see the ad run, and set a daily limit and Facebook will tell you what your ad will cost for the time frame selected. In our audience below it shows a possible reach of 130,000 people. At $10 per day Facebook estimates you would reach between 340 - 1400 of those people each day. Increasing your daily budget would increase the number of people reached per day. With a budget of $10 per day Facebook shows that you will spend no more than $70.00 for the week. The exact daily amount may vary slightly as Facebook's algorithm spends slightly more at the beginning of an ad, in an effort to identify the best prospects for your ad. If you haven’t run ads previously you may want start by running your ad for a short duration to test your ads and get an idea on your return. Select a Start and End Date and tell Facebook exactly which days you want your ad to run. You can always expand the reach and duration of your ad and run it again. If you run a campaign for a few days at $10 dollars a day, that should give you a basic idea on how your campaign will perform. All days do not perform the same on Facebook, but you can still get a feel for what type of return you can expect before spending more money. You could also test a slightly different version of your campaign. Use a different call to action, a different add image, maybe select a different geographic region, or different days of the week and see if you get a different result. When you do this type of testing, the insight you gain will help you tremendously on your next campaign(s). When you complete the add you will simply figure your conversion rate to decide if you are willing to spend more money in the ad, or go back to the drawing board and work towards a better ROI. For our example below, we assume you have a blog or landing page that you want to share through your Facebook Ads. After setting your budget, select Landing Page Views in the Optimization for Ad Delivery field. When you are happy with this page, continue on to the next. At the top of the next page you can name your ad. Be sure to create a name that will make sense when you are looking at your ad in the future. Review the Identity section and make sure the Facebook page listed is your page before moving down to the Format section. For this ad we are using a single image format. Depending on your specific add, you could use whatever seems most appropriate. I think it's a good to keep your first couple of ads simple so you can better analyze what is working and what is not. The section after the Format section is the Image section. I've skipped that one for now and went down to the Link section, shown below. That is where you will paste the link to your landing page. Facebook will try to pull an image from your landing page to use as the add image. If you don't have an image on your linked page, or it just doesn't work for your Facebook ad, you can go back up to the Image section and upload the appropriate image. Below the Website URL field you will find a spot for your ad headline. Take your time to think of a short, concise headline that will urge your prospects to click the link. In the AD Preview you'll notice a pull down menu that shows Mobile News Feed. If you click the pull down you will see additional options like Desktop News Feed, etc. This will show how your ad will look in different formats, allowing you to adjust your ad accordingly. When your happy with how your ad looks and reads press the green Place Order button and you've just created your first ad. Facebook will review your add to ensure it doesn't violate Facebooks Advertising Policies before they approve it. Well, there it is, your first Facebook Ad campaign. But lets be honest, the work is just beginning. Once your add starts running it's time to measure your results and adjust your campaign appropriately. Try different content, different length articles, formats, time frames, etc. Find what gets the best responses from your specific niche and keep fine tuning for success. Facebook will show you a variety of metrics, like click-through rates, daily spend and engagement. It's good to review all the data. Be sure to key in on the data that matters most for each ad campaign. In this case you would want to keep on eye on how many clicks you are getting through to your landing page. The click-through rate would be key on this campaign. Once a prospect clicks through and is on your landing page, you will monitor that page in a similar fashion, outside of Facebook. If your landing page isn't converting many prospects into leads, that would be an issue on your landing page, that should also be understood and corrected. Make sure your looking at the data that really matters according to your goal. It is important to see this as a process. Monitor how your ads perform, change up your content and tweak the settings to find your sweet spot. If you are consistent in putting the effort into creating relevant content offerings to your audience, you will see the benefits it brings to your business. It can be a slow roll at first when gaining traction on social media. Nevertheless, don’t let that discourage you. Growing a business is a marathon. If you’re willing to put in the time and learn as you go, you will see it all pay off. There aren't many platforms with the reach and ability to hyper target your audience the way Facebook does. Especially if you're audience is the senior market. Know that seniors have proven to be slightly more expensive to market to compared to younger buyers. You will pay a little more per prospect compared to a 19 year old. That's just the nature of our business. 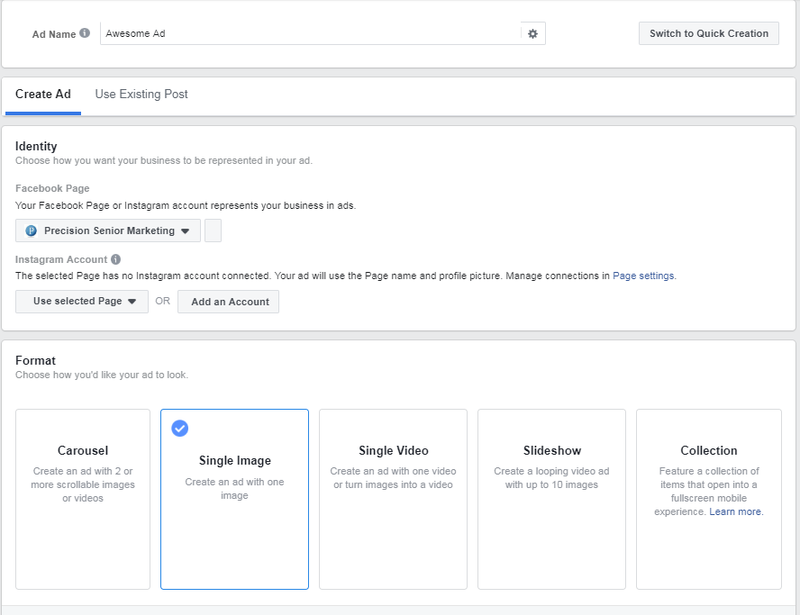 With the ability to set a modest budget to run a couple ads and learn what is getting the best conversion, you can find your prospects without spending a ton of money with Facebook Ads. Stick with it and take the time to understand how Facebook Ads operate and you won't be disappointed. Always remember that social media is only one part of your marketing strategy. Leverage face to face meetings, network events, etc. as sources of content. Tell your stories, so that your audience sees the bigger picture of who you are and all you put into your business. Let's face it, social media isn't going anywhere. If you don't learn to use it now, you may be losing out to the people or agencies that are.